The Oster® Classic Series Whirlwind™ Blender PLUS Food Chopper makes delicious possible. Unleash your culinary creativity in the kitchen with its innovative, multi-point Whirlwind™ blade that reaches up to blend even the toughest ingredients effortlessly. From milkshakes to salsas, you'll be amazed at what you can create. 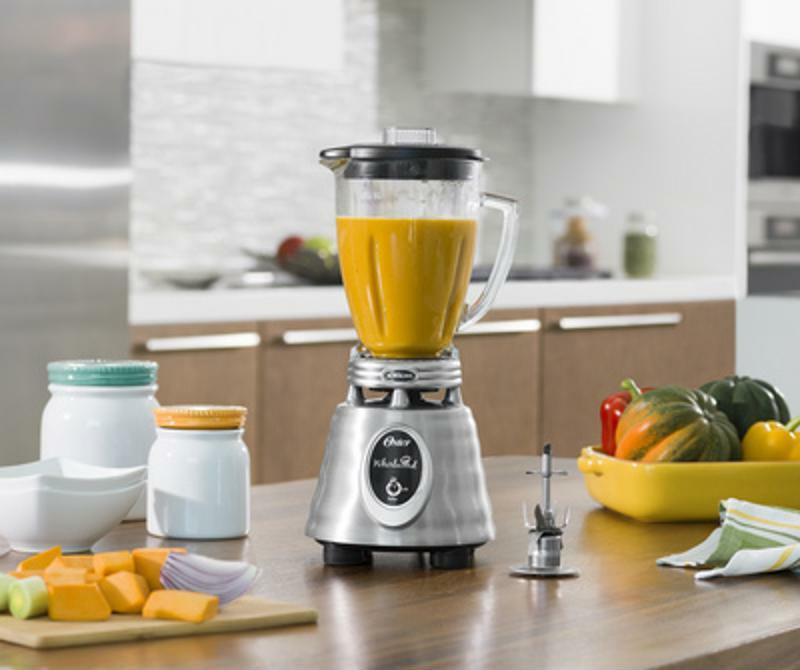 The Oster® Classic Series Whirlwind™ Blender PLUS Food Chopper features the new and innovative multi-point Whirlwind™ blade, which features multiple levels of blades from top to bottom for thorough and even blending every time. The Whirlwind™ blade spins rigorously by a powerful motor running up to 1000 watts for the smoothest shakes, smoothies and sauces you've ever made, slicing through and breaking down even the toughest ingredients. And it makes jar jams a thing of the past. Healthy and delicious meals are now easier to create than ever before thanks to the quick and easy Food Chopper attachment. Say goodbye to chopping, mincing and slicing, and instead reach for your Oster® Classic Series Whirlwind™ Blender PLUS Food Chopper, which can help you prep dressing, salsa, dip, sauces and more. It'll be your dependable go-to tool in the kitchen, helping you save prep time so you can sit down and enjoy fresh and tasty meals faster than ever before. Like every Oster® product, the Oster® Classic Series Whirlwind™ Blender PLUS Food Chopper is made to last. You can count on its superior quality and lasting durability with DURALAST™ All-Metal Drive, the ideal metal-to-metal, jar-to-base connection which carries a 10-year limited warranty. The Oster® Classic Series Whirlwind™ Blender PLUS Food Chopper goes beyond smoothies to make a variety of other treats. Blend thick and creamy restaurant-quality milkshakes in 30 seconds to enjoy with burgers and fries or on their own as indulgent treats. Salsas bursting with flavor can be made in under a minute for dipping tortilla chips or topping grilled chicken, beef or seafood. Creamy pumpkin soup, coconut mousse, 5-layer Mexican dip and crispy salmon burgers are just a sampling of the delicious meals you can create.